Hats off to our real heroes in uniform, man. The thing is oftentimes they don’t get nearly enough appreciation as they should, because oftentimes they’re not painted as the heroes they’re supposed to be due to life and the fact that accidents do happen. Not everyone can save everyone. But everyone can offer free gifts…like custom emergency first aid kits. Firefighters or paramedics can make appearances in schools and practically give those suckers away. Let everyone know that they’re still heroes…even when they’re not actually doing what they do out there in the field. It’s great stuff. The community needs to know that every now and then they’re real people and not just automatons responding to calls and going through the motions hoping for a good day. Firefighters and paramedics: they really truly believe in what they do. And when sending in free gifts like custom emergency first aid kits to, perhaps, a prior victim surviving a crash, fall, explosion, or any other disaster, sends a long-lasting message to all: that our servicemen and servicewomen do what they do because they care. The ultimate result is more funds. More support. More hope. Our firefighters get the resources they need to keep fighting the flames. Paramedics keep doing what they do through the long hours, because they have all the motivation they need, not just from hospitals and administration — but the patients they end up saving every day. And Who Knew All It Would Take Is a Free Gift From BRAVA Marketing?? Did we tug at the heartstrings enough there? No? 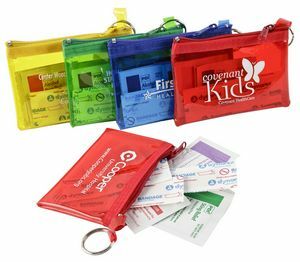 Check us out at BRAVA Marketing and see the many options we have for custom emergency first aid kits. They’re simple. Sweet. And awesome. Find something you like? Just contact us! And let’s make your station or team stand out in your community today.